After a relatively slow start to the 2013 season, May really delivered in style with 93 fish landed in total with some magnificent fish included. It now becomes the third best May in Delphi’s angling history, only being surpassed in 2009(100) and 2011(122). 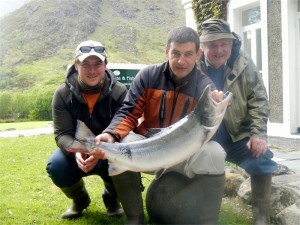 There was also a 15lbs+ fish landed, which is spectacular for a small fishery like Delphi. The first four days in May ended with a German party landing 4 fish and this happened to coincide with some good water on the Friday. Week 19 then began with high water conditions that continued for most of the week as we had 126.3mms(4.97”) of rain. 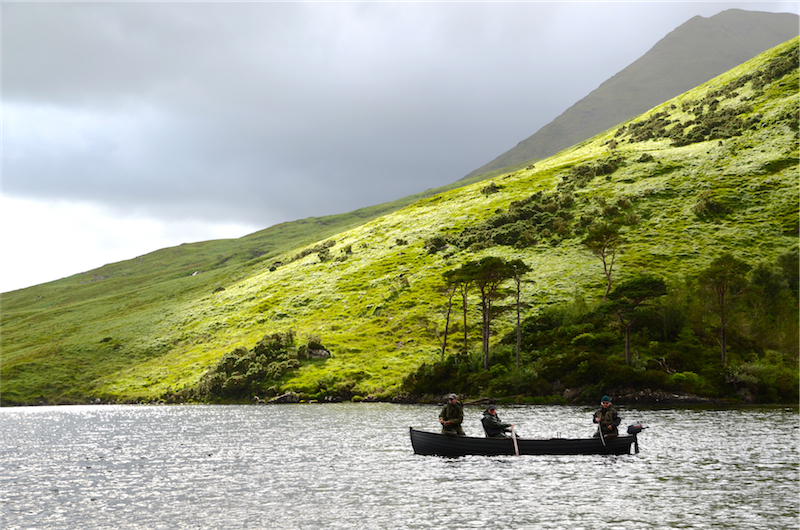 The fishing however was slow to get going, with the first fish only being landed on the Monday by one of the Sutherland party, Jimmy Keogh, a 5.5 pounder off Doolough. Brian McHenry then had one on the Tuesday off the river of 8lbs7ozs. From the Wednesday on the Sutherland party (including Angus himself, Denis Daly, David Felton and Peter O’Reilly) really began to show it’s class landing 10 fish without reply. Chris Jarman managed to land a fish on his first morning off the river on Saturday. Veronique Guiraud also landed her first ever of 7lbs14ozs off Finlough and Paul Wymes landed two also off Fin. That brought total for the week to 16 fish. Week 20 had excellent conditions with the water being topped up throughout the week, with 53.2mms (2.09”) of rain. First day of the week started in style with 8 fish landed. Leigh Hookes had 3, Ronan Murphy 2, Paul Shalvey 2 and Peter Milne 1. There were 5 landed on Monday, with Ciaran Boland having 3, Chris Jarman 1 and Chris Wathen 1. Tuesday we landed 4 fish; Paul Shalvey had 1, Ronan Murphy 1 and Chris Jarman 2. Wednesday, there were 5 landed, with Leigh Hookes having 2 again, Robbie Burton 1, Ciaran Boland 1 and Paul Smyth 1.Thursday we had 5 with Peter Milne, Stuart Lyon (thank God), Ciaran Boland, Peter Joyce and Rocky Moran all having one each. Friday was a little quieter with only four landed three off Fin, one by Andy Bowman and then Paul Wymes had two including one of 15lbs11ozs on an Arrabell shrimp. Ciaran Boland also had one off the river of approx. 14lbs. Saturday we had just the one taken by Andy Bowman off the river after he had risen a fish a dozen times to a Collie Dog. It is also worth noting that there were 4, 15lbs+ fish lost in a 24 hour period from Friday lunchtime to Saturday lunchtime. Total fish landed for week 20 was 33. Week 21 was a much drier week with only 14.3mms (.56”) of rain, but the river held up nicely and an excellent week followed with almost all anglers landing fish. Barbara Ceillier was first off the mark with one off the Rock pool on Sunday. There were three on Monday with Simon Albertini, John Plumb and Steve Jones all landing fish off the river. Tuesday it was Fin that proved successful, with Steve Jones and Amanda Higgins having one each. Wednesday Pat O’Dwyer and Niall Higgins had one each off the Waterfall. On Thursday Arthur Jardine had one off the river and Simon Albertini and Chilton Owen had one each off Fin. On Friday we had six, with Amanda Higgins landing two, Elizabeth Thompson, Arthur Jardine, Charles Dring and Paul Welling all landing one each. On Saturday Martin Ceillier and Brian O’Donohoe had a fish each off the river. That brought total for week 21 to 19 fish. There were generally good fishing conditions for most of week 22, with 36.5mms(1.44”) of rain, with the river holding up well most of the week. Temperatures were also trying to creep up to more normal values. Barbara Ceillier again got the week off to a flyer with a beautiful fish of approx. 14lbs off Doo. David Walmsley also had one and Martin White had his first ever off the Waterfall. Finlough was the place to be on Monday with six landed. David Walmsley had three in a session with Michael Healy, who had one; Barbara Ceillier had one and Alexander O’Sullivan also landed his first ever. On Tuesday we again landed six, three off Fin, Bertrand Fenart, Jack Meredith and Steve Brennan and three off Doo, David Walmsley, Jack Meredith and Jean Luc Chereau had his first ever. On Wednesday Paul Wymes was again on the scoresheet with two. Thursday Michael O’Sullivan had his first ever, off Fin, Jean Luc Chereau had another off Doo and Eric Zijdendos had a fish off the river. On the last day of May there were two fish landed off Fin, one by Bertrand Fenart and one by John Wall. All in all it was an excellent month’s fishing with a total catch of 93, with 40 off the river, 41 off Fin and 12 off Doo.